Suspension bridges, they’re polarizing; you love them or hate them. Visitors seem to either hop joyously along their span – encouraging walkways to bounce about – while others make haste across them. 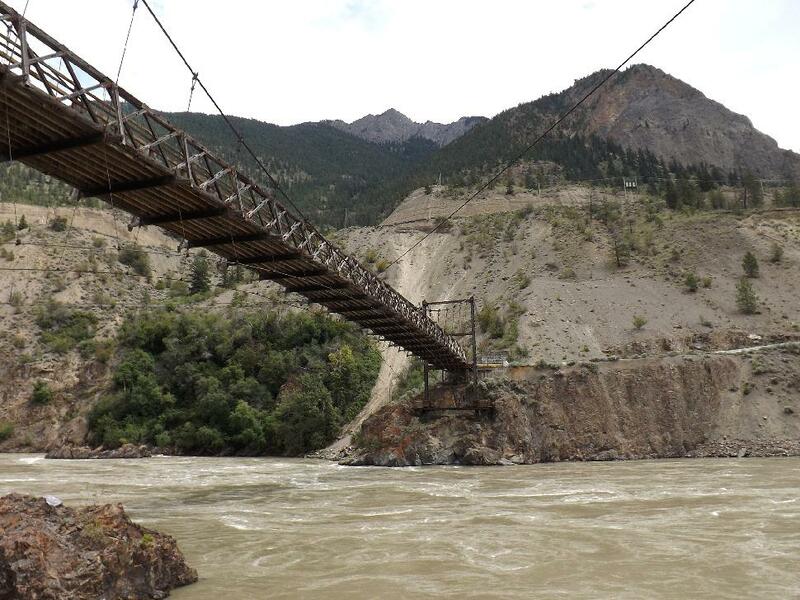 With such varied terrain and rivers spanning the province, suspension bridges are often built out of sheer necessity. Gorges that simply can not be traversed with alternative designs see these graceful arcs drawn across two anchors. 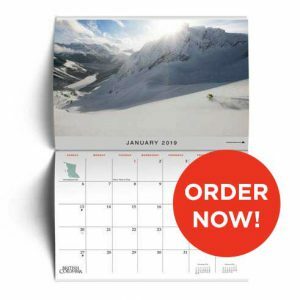 Here we recount some of our favourite B.C. suspension bridges, from past to present. Some early ones have since been demolished, others zip us across the creeks of epic wilderness pursuits, and iconic ones are part of our daily commute. Oh, and at least one on this list has collapsed…Enjoy! History: The bridge was originally constructed in 1861 by Joseph Trutch, who worked as the Commissioner of Public Works for the Colony of British Columbia. The bridge was part of the Cariboo Road development. Royal Engineers rebuilt the bridge as the road construction progressed, and a new span opened in 1863. It had fallen into disuse by 1884 and in 1904, most of the bridge was destroyed in a flood. The remains were dismantled in 1912. History: This bridge is still in use today, but in 1964 the government reduced its use to foot traffic only. Status: This bridge was replaced in 1931, and the replacement bridge is still open today. History: The current bridge spans the same location as the original, and it was reinforced again in 1990. 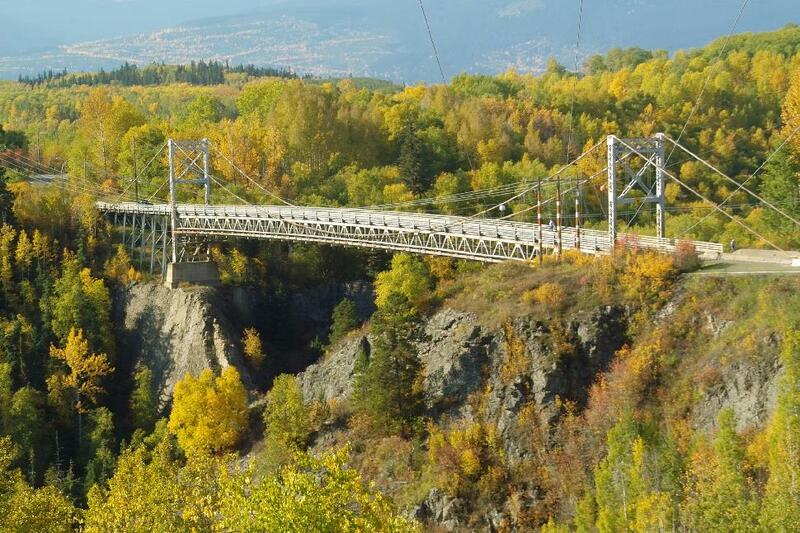 It sits 80 metres above the Bulkley River. History: The suspension bridge allows hikers walking the Monkman Lake Trail to cross the Murray River and continue their adventures into the park’s interior. 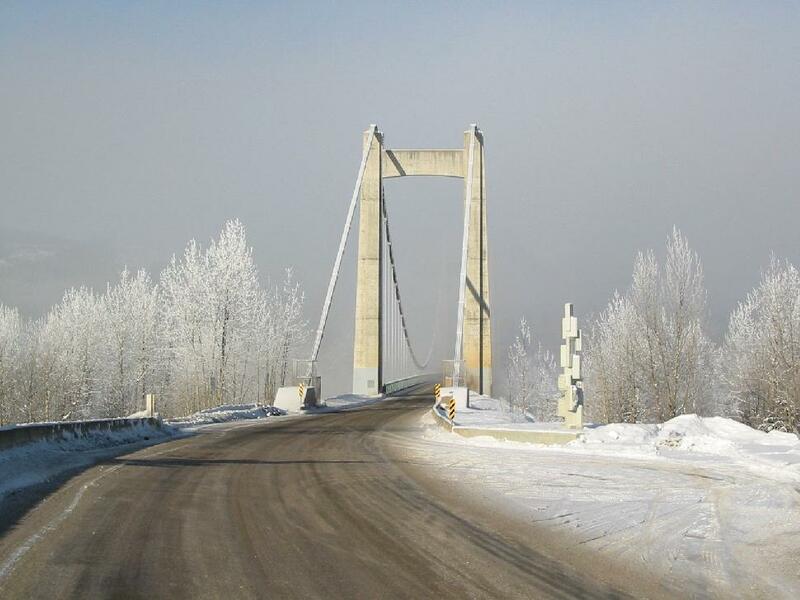 History: The bridge was originally used to connect Brilliant, the business and industrial hub of a recently established Doukhobor community, with its agricultural property and other villages on the other side. 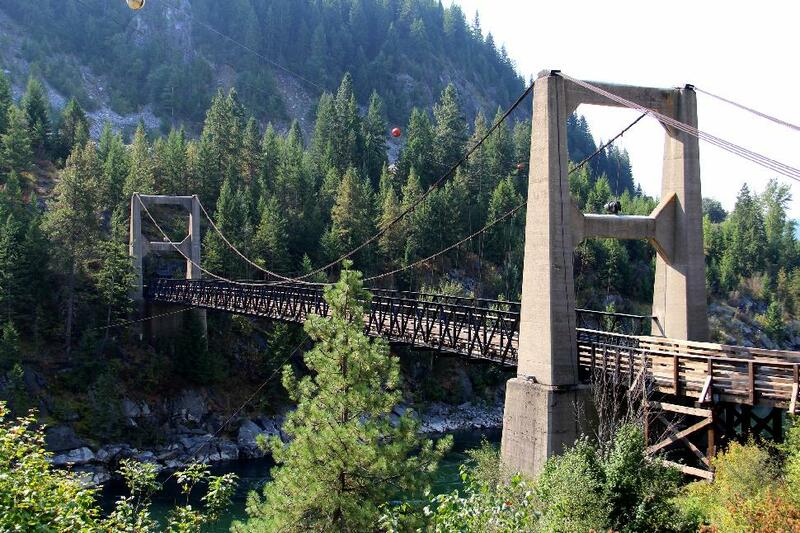 Although a Vancouver firm oversaw the design and construction, the bridge itself was built by Doukhobor working crews using traditional hand tools and techniques. The Doukhobor community paid for two-thirds of the bridge, with the provincial government contributing the rest. The bridge was closed in the late 1960s, when it was replaced by a more modern version. The Brilliant Suspension Bridge recently received its status as a Canadian National Heritage Site. 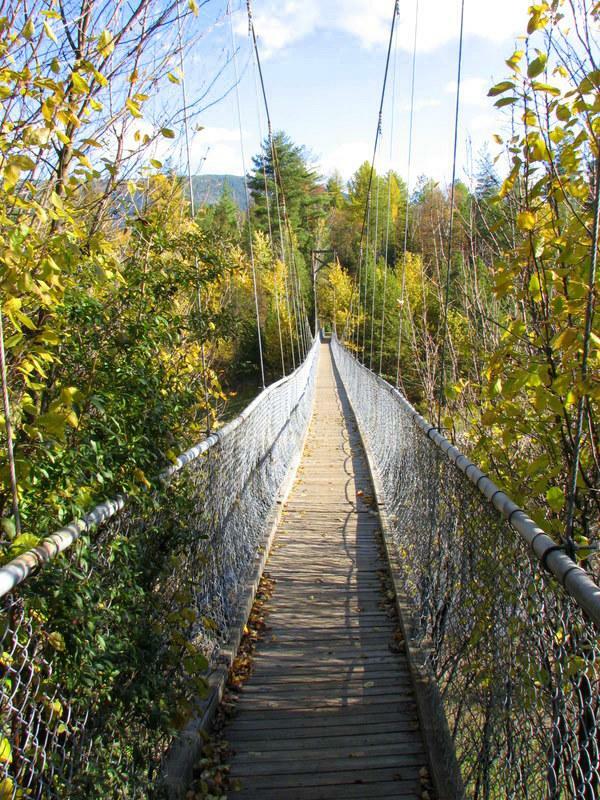 History: As part of the Trans Canada Trail, this suspension bridge allows hikers to cross over Haslam Creek. A final bridge to cross over the Nanaimo River is still under construction. 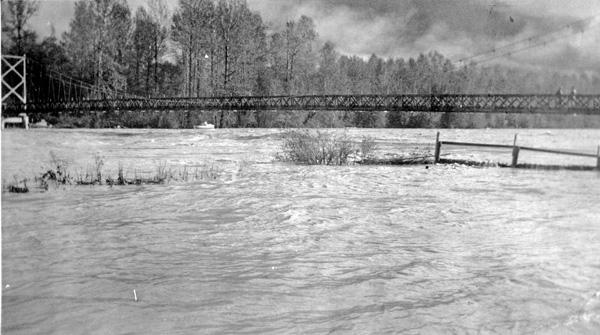 History: The Churn Creek bridge runs over the Fraser River and is located on Gang Ranch, a working ranch that was established in the early 1860s. At its peak, Gang Ranch was as large as four million acres, including leased lands. At the time, it was largest working cattle ranch in BC. There is a public road that runs through the property and across the bridge now, but the ranch is still in full operation. History: The Old Bridge was built to replace a reaction ferry – a type of cable ferry that was powered by the river current. This type of transportation across the river had been in use since 1860. History: The suspension bridge is located just past Mt. Currie and spans the Birkenhead River. History: The Lions Gate Bridge crosses the first narrows of Burrard Inlet and connects the city of Vancouver to North and West Vancouver. Northbound traffic on the bridge gets a good view of The Lions, a pair of mountain peaks north of the city – this is where the name “Lions Gate” comes from. The bridge was designated as a National Historic Site of Canada in March 2005. History: The Kelowna Mountain Vineyards & Bridges is a privately owned park and four suspension bridges cross over the vineyards. 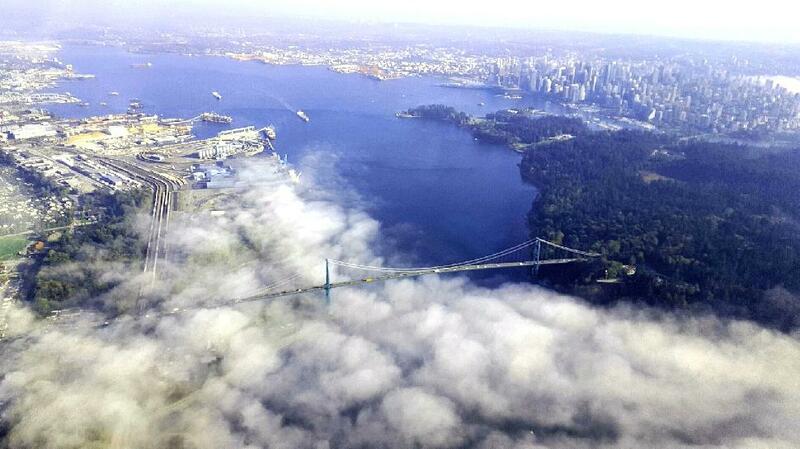 One of these bridges is the longest in North America. Span: The Earth Bridge spans 400 feet; the Sun Bridge sits 100 feet over an ice wine vineyard; the Water Bridge is 800 feet long; the Vine Bridge finishes at a koi fish pond and outdoor amphitheatre. 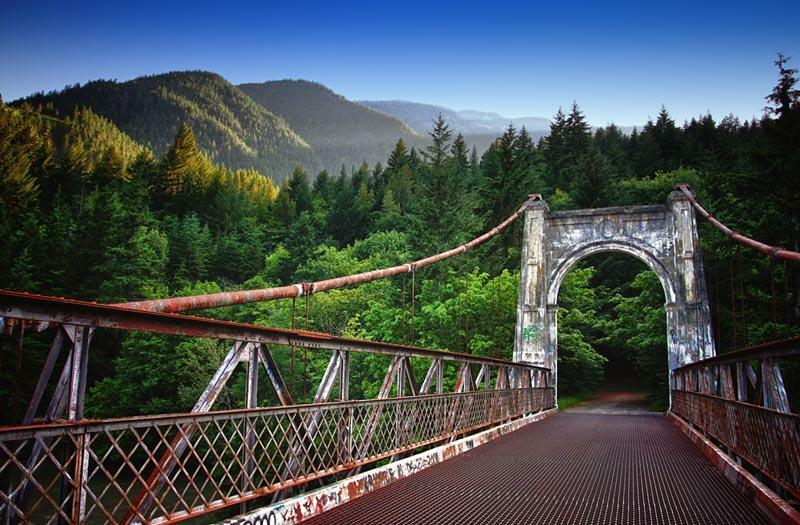 History: This suspension bridge was erected along the Top Bridge Trail, as a way for visitors to cross over the Englishman River gorge and continue touring the area. 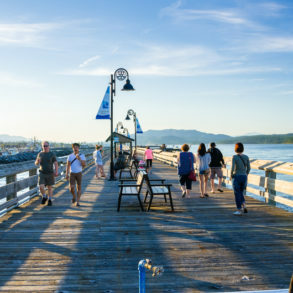 This is considered one of Parksville’s secret gems. 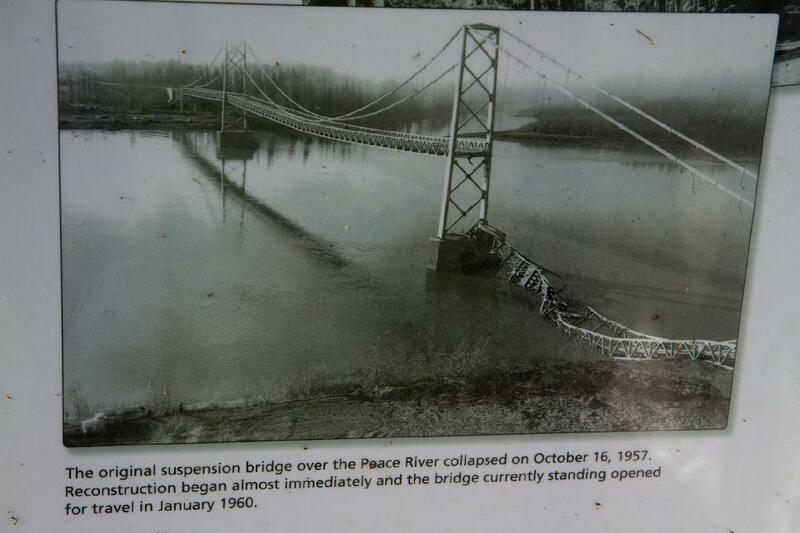 History: The Peace River Suspension Bridge was opened in 1943 and collapsed on Oct. 16, 1957. There were no injuries or fatalities that occurred as part of the collapse. When the bridge opened, it was the longest bridge on the Alaska Highway. The Peace River Bridge has since replaced this suspension bridge. 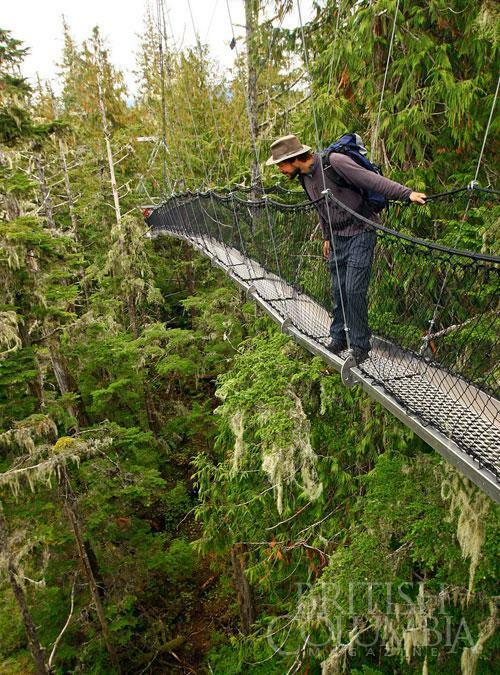 History: There are a few suspension bridges along the Juan de Fuca Marine Trail. 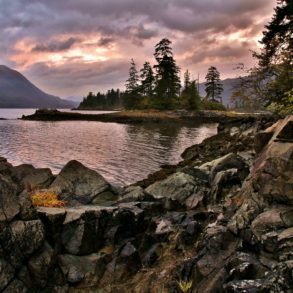 The trail stretches 47 kilometres along Vancouver Island’s western coast. 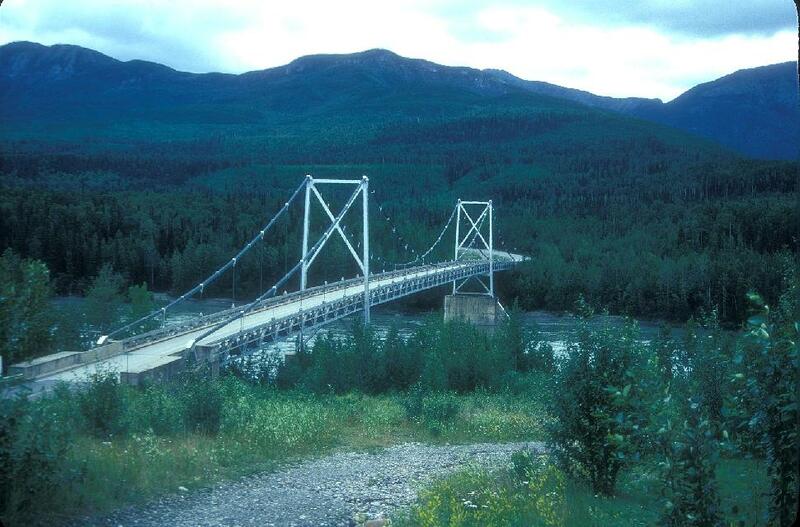 History: The Lower Liard River Suspension Bridge is the only suspension bridge along the Alaska Highway. At the time of construction, engineers decided to build a suspension bridge because ice conditions made it impossible to keep the temporary scaffolding in place for a long enough period of time to complete a traditional truss span design. 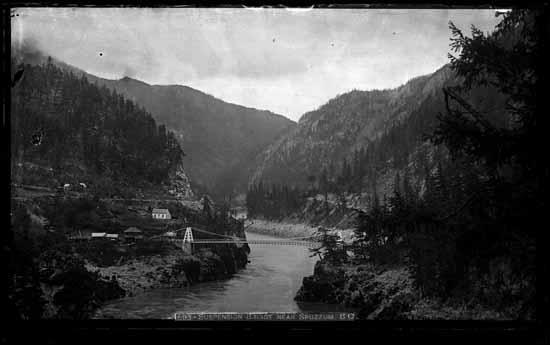 History: Where the Sheep Creek Bridge now resides, there used to be a suspension bridge instead. History: This small suspension bridge is accessed along Burnt Bridge Creek. The original 1932 bridge was removed and replaced with a newer suspension bridge in 1957. History: Highway 29 crosses the Peace River via the Hudson’s Hope Suspension Bridge. History: Bright Angel Provincial Park is 4.13 hectares of land that was donated to the government by Jack and Mabel Fleetwood. Jack strongly believed in guardian angels, and the park was named after that ideal. The suspension bridge was constructed over the Koksilah River. History: The Nisga’a Village of Gitwinksihlkw has had a suspension bridge over the Nass River for more than 400 years. The current bridge is over a metre wide, and although there is a traditional road bridge into the village, the suspension bridge has been fully restored and serves as a tourist destination for locals and visitors crossing the Nass River. 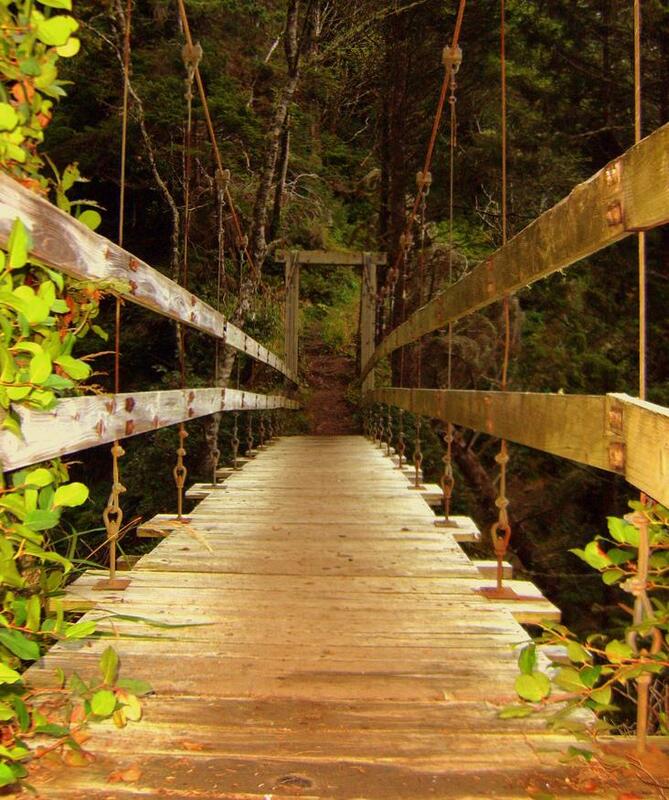 History: This wooden suspension bridge is a highlight for hikers taking on the West Coast Trail. 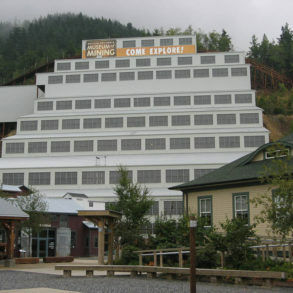 History: The highest bridge ever built in Canada, standing at 570 feet, the Similkameen Ore Conveyor was erected as part of the Similco copper mining company just outside Princeton. As much as 1,600 tons of ore can cross the conveyor in an hour. History: Built in the Zuckerberg Island Heritage Park, the suspension bridge was developed as a field exercise for the 44th Field Engineering Squadron and was allowed to remain as a connection to the island. The bridge won the Canadian Militia Herztberg Award and all of the materials to build the bridge were donated. History: Constructed as part of the West Coast Trail. Online reports say the bridge is a neat feature of the trail, but climbing up the ladders to get on and off the bridge is a bit scary. History: The bridge was a joint project between BC Parks, BC Hydro, the Campbell River Rotary Club, the local government and the BC government as a way to get more visitors to Elk Falls and make the park accessible for more people. 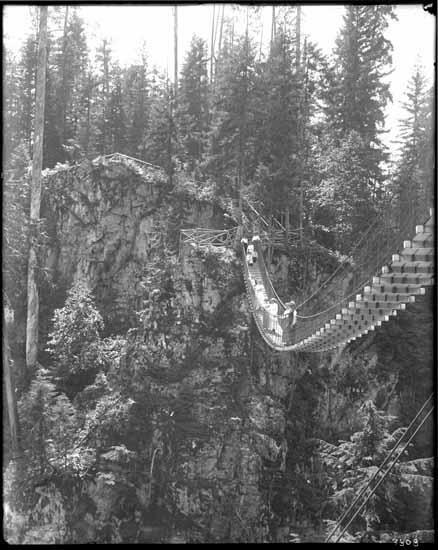 History: The suspension bridge was constructed as a way for hikers to get over Summit Creek, while taking the Dewdney Trail. History: This suspension bridge was built in front of the Crazy Creek waterfalls for optimum viewing opportunities. There are also boardwalks and viewing platforms for the falls. History: The bridge was built as a way for farmers to cross Eagle River to the nearest community and school. It was rebuilt in 1940. History: The Capilano Suspension Bridge Park is a popular attraction in Vancouver, taking visitors through the west coast rainforest. 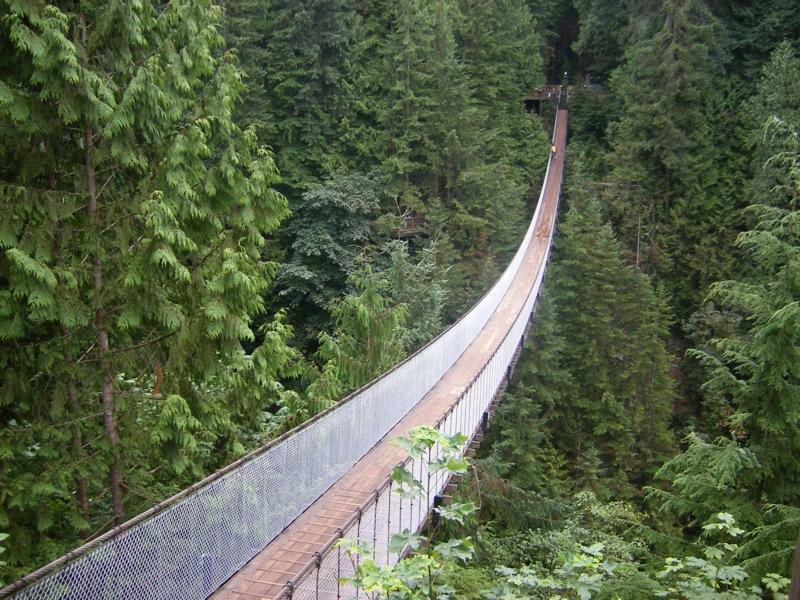 The bridge runs 230 feet above the Capilano River. History: The original bridge was lost in a flood in 2012. The government installed this bridge as a means for visitors to access the rest of the park and hiking areas. History: The suspension bridge was built as a way for tourists to cross the Hells Gate gorge, which is the narrowest point of the Fraser River. At high water, over 200 million gallons of water flow through the gorge per minute. History: The bridge is part of the Ripple Rock Trail and crosses Menzies Creek. It was replaced in 2014 and the trail was resurfaced. History: This 50-metre-high bridge stretches across Lynn Canyon’s raging waters, waterfalls and pools. The bridge is a popular destination, but it can be nerve-wracking to cross! History: The suspension bridge crossing Logan Creek is part of the West Coast Trail – one of the more rugged parts. According to hiker testimonial online, the suspension bridge (and the ladder to get down to it) is not for the faint of heart. 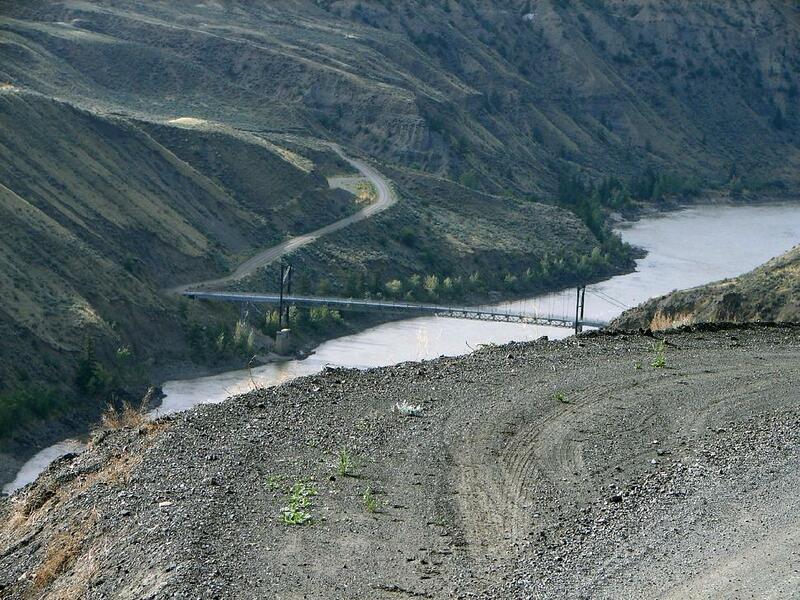 History: The bridge crosses over the Tutshi River and canyon and serves as an amazing look out point to the surrounding area. 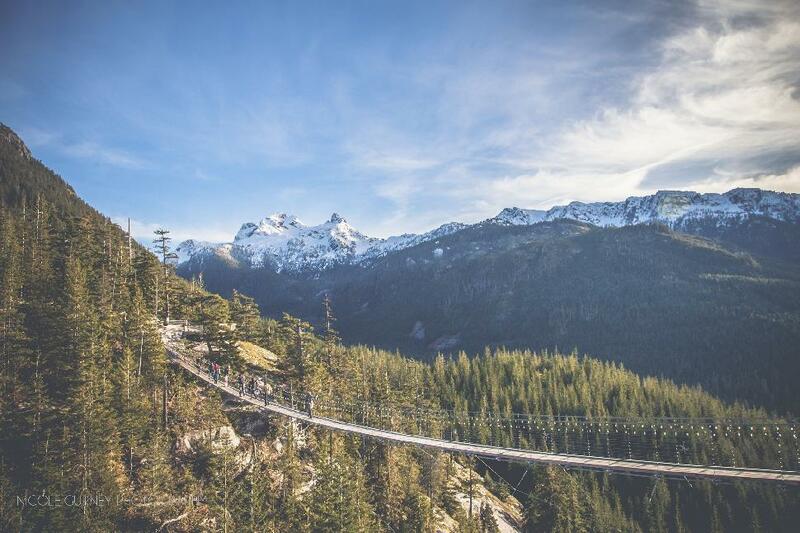 History: The suspension bridge was created as part of the Sea to Sky Gondola project near Squamish. The bridge will link parts of the project together and will give tourists a 360-degree view of Howe Sound. History: This trail has a short history as it was only opened in 2012. A community collaboration between multiple partners. 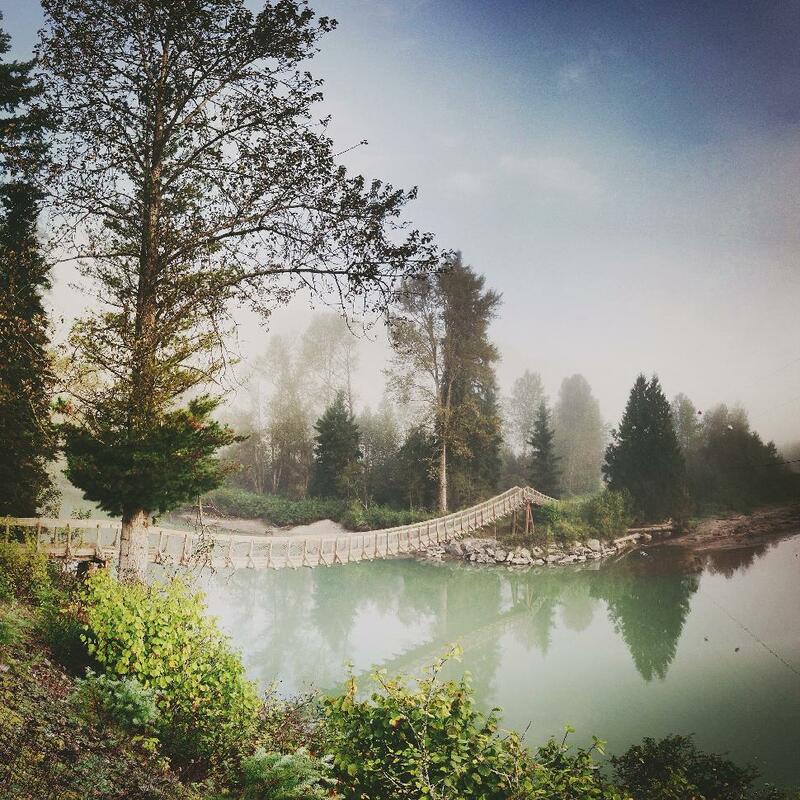 The bridges were designed by John Helston who has designed comparable walkways in Nigerian mangroves habitats. 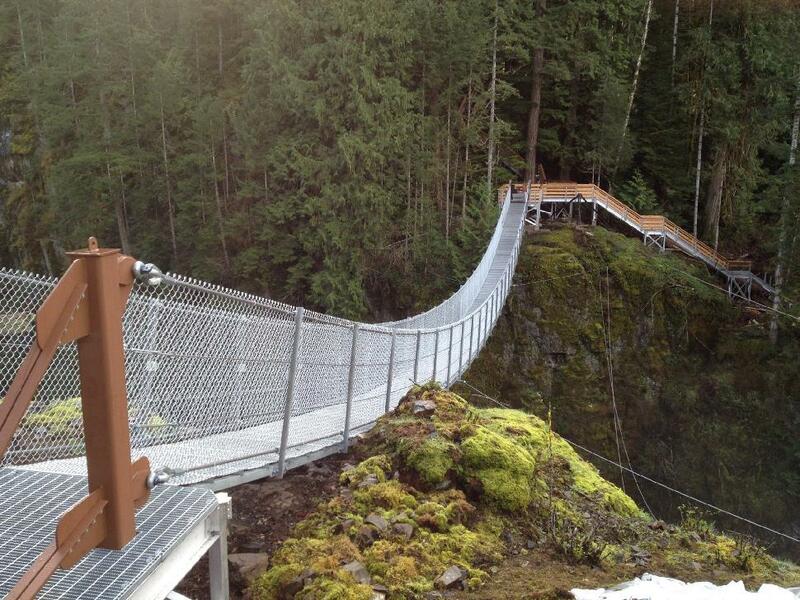 History: This suspension bridge was erected as part of the Sea to Sky Trail system. 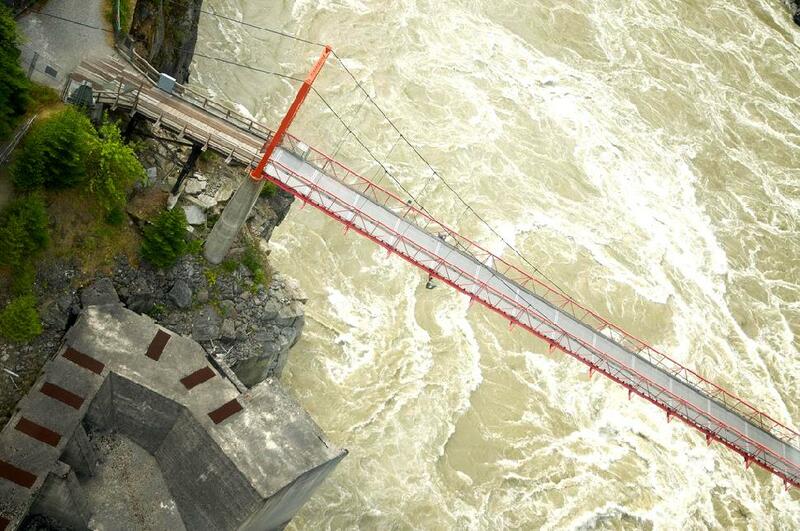 The bridge crosses Cheakamus River. 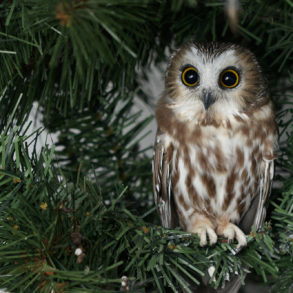 Do you have a favourite B.C. suspension bridge?